ASHGI is collecting blood samples for Dr. Ned Patterson’s Aussie epilepsy study at the University of Minnesota. Blood samples from affected dogs are greatly needed to keep the research going. If you cannot provide a blood sample from your dog at Nationals please go to our website for information on sending blood samples from your dogs directly to the University of Minnesota. RESEARCH BLOOD SAMPLES will be collected ONLY on Tuesday November 4, 2014 from 9 – 11 a.m. Please click on the ASHGI link for more information for “Epilepsy (U Minn)”. 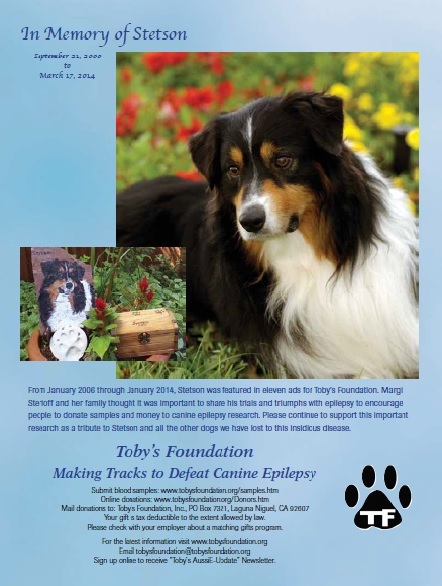 Please see Toby’s Foundation ad “In Memory of Stetson” in the September / October 2014 issue of Aussie Times and the Australian Shepherd Journal and on our website and on our facebook page. I had the privilege and honor to meet Stetson in September 2013 at the ASCA Nationals in Greeley, CO. His mom Margie had brought Stetson there for his 13th birthday. It was also the venue where his promising show career had begun but was cut short by epilepsy. Stetson had a gentle and loving spirit. He was kind and beautiful even at thirteen. He greeted me as a friend and posed for a few photos with me. He made me feel right at home with him. Stetson worked side by side with Toby for many years to help bring Toby’s Foundation to the forefront in the fight against canine epilepsy and raise awareness about this disease that claims so many precious lives and devastates so many families. Stetson did so many ads for us that it would have been very difficult for Toby and me to have fought the good fight against canine epilepsy without him and his mom. If you have not seen our 2013 TF Scrapbook from the ASCA Nationals in Greeley, CO please check it out. It includes photos of Stetson with his mom, Margie and Toby’s mom.